There has been a regime change in Botswana. Ian Khama – the great and doctrinaire elephant protector – has been replaced with a new president, Mokgweetsi Masisi. Botswana’s nature-lovers can thank their lucky stars that, at last, they have a president at the helm of their country who has some wildlife common sense between his ears. When asked about the terrible state of Botswana’s wildlife resources a few years ago, I said that nothing would change, or could be changed, about that humongous disaster that had taken place in Botswana, until there was a regime change in the country; until Khama departed from the political stage. Now it has happened. Hurray! One of Masisi’s first announcements after having been being elected the country’s new president, was that he intended to re-introduce safari hunting – particularly elephant safari hunting – into the country’s wildlife management programme. And now the animal rights NGOs are getting worried. A recent public petition/statement by one of them was: “Please, President Masisi, don’t kill our country’s elephants”. Are these people – the animal rightists – really that crazy? Don’t they understand anything about wildlife management? Don’t they understand the predicament that Botswana’s wildlife sanctuaries are in because of the fact the country is carrying far too many elephants – and has been doing so for more than sixty years? The first reports to the effect that the riverine forests along the Chobe River, in the Chobe National Park, were being destroyed by too many elephants, were delivered to the Botswana government, in 1960. And that was done by Dr Graham Child (pers. comm.). And, as far as I can determine, the numbers of elephants in Botswana, in those days, was about 7500. Today Botswana’s elephants number in excess of 200 000; and the Chobe riverine forest has long gone; so has the once famous Chobe Bushbuck; so have most of the ancient (1000 to 5000 year old) baobab trees that Chobe once protected! And in 2013 the Botswana government admitted that the “other wildlife” – other than elephants – had declined by between 60 percent and 90 percent in all of Botswana’s northern wildlife sanctuaries. A game reserve’s ‘elephant carrying capacity’ is the maximum number of elephants a game reserve can carry without causing irreparable damage to the game reserve’s habitats. So, if in 1960, the Chobe riverine forest was (already then) being demolished by too many elephants – and the elephants then numbered 7500 – that meant 7500 elephants was far too many elephants for Northern Botswana to sustainably carry. And if Botswana is now carrying in excess of 200 000 elephants – which it undoubtedly is – Botswana’s game reserves are carrying, altogether, more than 26 times the numbers of elephants that they should be carrying. No wonder the country is losing its “other game” – and its overall biological diversity – so fast. The total mismanagement of elephants has at last caught up with the authorities. 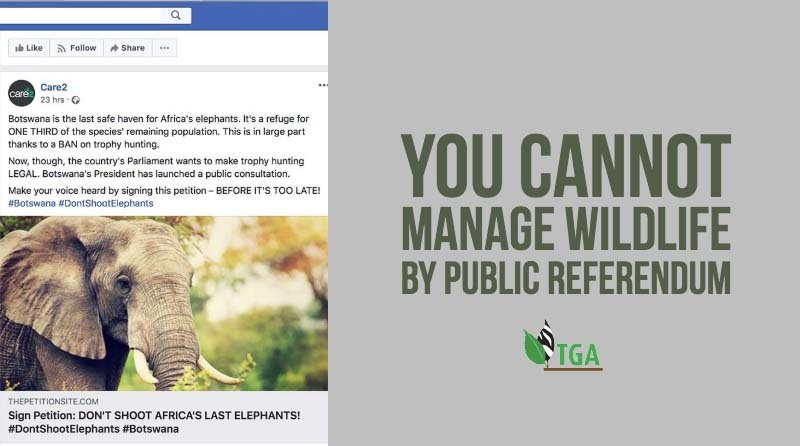 And now the animal rights NGOs (sitting in California and never been to Botswana or Africa) are pleading with the new President not to kill Botswana’s elephants. I despair that southern African society will ever regain its common sense! What are the management realities of such a state of affairs? The fact is – the truth is – that If Botswana’s national parks are to be saved for posterity, the first action that Botswana needs to take is to reduce its elephant population by no less that 50 percent – and THAT is just to start with! ← Uncovering the Truth – Captive Lion Breeding (CLB) Controversy in South Africa. Don’t pay any attention to the people from California or any of the other ARAs here in the states. 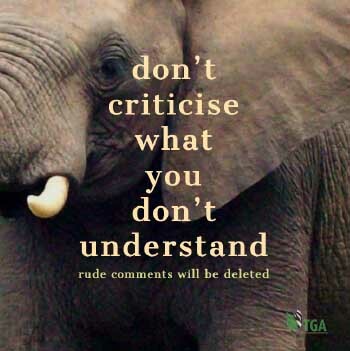 Do what’s best for Botswana and thin the elephant herd, if it not to late!